How should I interpret decimals in guitar tabs? I found this in the Black Clouds & Silver Linings - Dream Theater Guitar Tab Book. 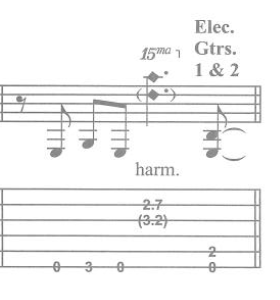 The notation implies a harmonic on the second and third strings, but what do 2.7 and 3.2 mean? I believe that this is referring to where you would place your finger to get the desired harmonics. The harmonic that generates the major third is right before the 4th fret, which would be 3.85. 3.2 would be a harmonic near just beyond the 3rd fret, which should give you a D on the G string. This picture outlines the placement of the harmonics and the decimal representation for some of them. Looking at the harmonic that shows not in parentheses in your example, the image doesn't match decimal-wise but you can see that the note that corresponds is the same. Not the answer you're looking for? Browse other questions tagged guitar electric-guitar guitar-effects tablature harmonics or ask your own question. Playing Guitar Tabs on Piano? E chord with arc and dot symbol over it - What is this symbol in a guitar chord song book? How to interpret this ASCII tab? In MuseScore, is it possible to add tab to an existing bass notation so I'd get both notation and tabs for bass? Do key signatures indicate changes in tablature fret numbers?